A Universal Silicone Straw Lid, let's drink to this. Okay, technically Snug is made for kids who are old enough to drink through a straw but not old enough to stop spilling their drinks all over kingdom come. But the real beauty is that it’s perfect for just about anyone (you included, Butterfingers). 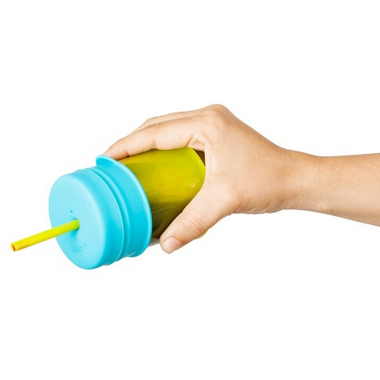 Snug silicone straw lids fit over any regular cup with a 2.5”–3” diameter. Just pop in a straw and start sucking. Wash thoroughly before initial use and after each use. Wash each piece separately. Dishwasher-safe or hand wash in warm, soapy water. DO NOT microwave. Can be boiled or sterilized. This is an interesting product. It's silicone that can stretch over cups but still sturdy enough it won't rip. I took off one star because the straws it comes with are bit short so you can't use them with taller cups. Also when you stretch the silicone over a cup, sometimes a vacuum is created and the pressure pushes the liquid out of the straw which can be very annoying. One thing to note is the silicone really attracts hair and lint. Just an fyi. Great invention! I just love how portable they are. 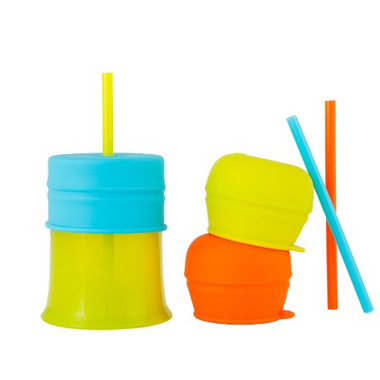 Great for throwing in my bag to bring to a restaurant that might not have kid friendly cups! Lifesaver!! Works so good with my 10 months old! I tryed thos 360 cups and hated them. With this Iâ€™ve hade bo problems and theyâ€™re so easy to use and transport! About as great as could be. Somehow my daughter can still turn her water into a fountain, but that's just her partcular gift. Nice bright colors and spill proof! These cups are spill proof; perfect for toddlers. The silicon lids are a little difficult to put on, but otherwise this set is great. We love using these when we go out to eat, as many restaurants will bring drinks for kids meals in a cup with no lid. Which, for my daughter = spills. They are thick enough to be resistant to tearing, unlike another brand we had previously tried. Love these! My son loves using a straw for his smoothies in the mornings. Other than him pulling out the straw from time to time, they are spill-proof and no mess! Excellent product. Fits all the cups we have in our house. Easy to clean unlike most dippy cup style lids. Regular straws fit in case you want to use a taller cup. Pretty spill proof. Son has turned glass on it's side and nothing has come out. But he can eventually make a mess by taking the straw in and out of the cup. Would be nice added feature if in the future they made straws with stoppers on them to keep kids from taking them out of the cup. Love this set!!!! I love that it comes with three kids. We always travel with one and I love that it works with other straws and cups. The vibrant colours are great as well. My son loves drinking like a big boy out of his own cup.